If you a re using IE, there is currently an intermittend bug that is stopping submission. Chrome is the preferred browser for MERIT. Alternatively, Firefox or Edge will also work. In a worse case scenario, you can submit via phone or tablet. 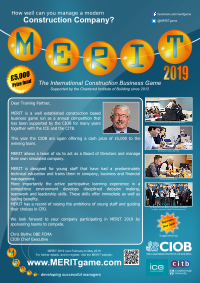 MERIT 2019 - They think it’s all over…..it is now! 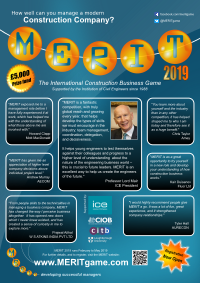 MERIT 2019 - Still in the lead – but the pack are closing! MERIT 2019 - You keep on knocking, but you can't come in. 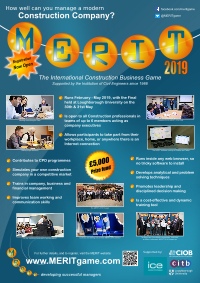 MERIT 2019 - Will Team-power take the title? MERIT 2019 - Plus ça change, plus c'est la même chose! "MERIT exposed me to a management role before I have fully experienced it at work, which has helped me with the understanding of what those above me are involved with." "MERIT provides a slightly more holistic view as to how different areas of the business interact with one another." "From people skills to the technicalities in managing a business company, MERIT has changed the way I perceive business altogether. It has opened new doors which I never knew existed, and has created a sense of curiosity in me to explore more." "You learn more about yourself and the industry than in any other competition, it has helped shaped me to who I am today and therefore see it as a huge benefit." "MERIT has given me an appreciation of higher level company decisions above individual project level." "Do we over work this project to finish it on time? Should we bid on this job because it has a larger value, or take multiple smaller jobs? When we started to pose those sorts of questions, MERIT became so exciting in my opinion, and it really felt like you were in the driving seat of a business."